When I wrote my blog title, it was to explain that the knitting of The Sweater has come to a screeching halt. But then I thought for just a minute and actually, our entire day today came to a very nice screeching halt due to some snow and some really really really cold weather. We didn’t get that much snow, but it was 10 below this morning. I think all the schools in the area are closed. So we are enjoying a nice day at home. That blizzard has brought things to a halt too in several states. I’ve been reading today about my family and friends in Oklahoma. Highways are closed, there was little or no mail delivery, grocery stores are pretty empty – it’s crazy! The sudden stop on The Sweater seems pretty minor in comparison. I merely ran out of the creme colored yarn. I’ve ordered some more, but they haven’t shipped it yet. I could get it at a yarn store here in town, but I don’t think the roads are great, and it is just too darn cold to go out. So it will have to wait for a day or two. Is this the craziest weather or what? 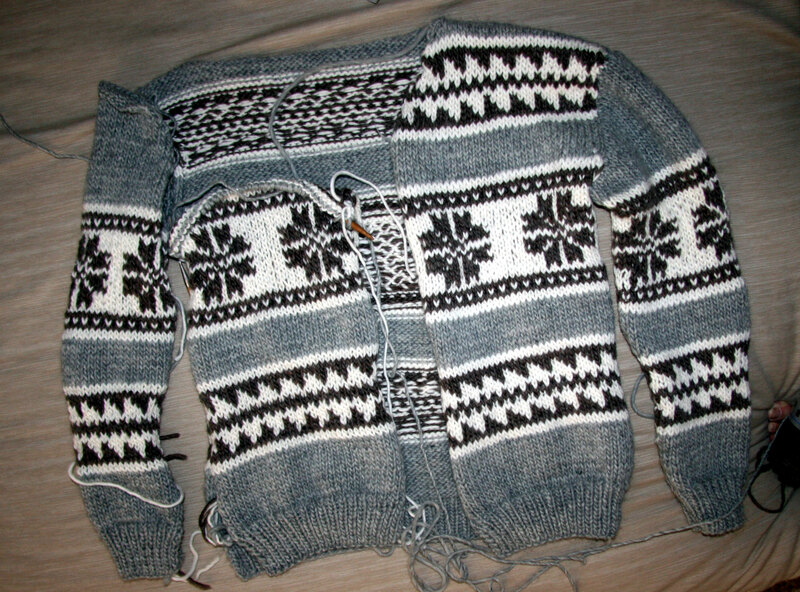 That’s going to be one really nice sweater! Oh, the sweater looks really great! I LOVE the sweater!!! You are amazing! The sweater is just gorgeous. You are blazing through it. At least you can cover up with it and stay warm while knitting!